AC Golden - Checkpoint Charlie - Berliner Weisse - October 7th. Arvada Beer Co - Fresh Hopped Goldline IPA w/Cascade - Brewers Reserve - October 10th. Arvada Beer Co - Fresh Hopped Goldline IPA w/Chinook - Brewers Reserve - October 10th. Avery Brewing - Liebenweizen - dark wheat ale - October 7th. Big Beaver Brewing - Cinnamon Apple Beer - October 7th. Black Bottle Brewing - Just A Minor Threat - Imperial IPA - returns October 8th. Black Shirt Brewing / Country Malt - Sticke Altbier - October 10th. Black Shirt Brewing / Dunedin Brewing - Hoppy Farmhouse Red - October 11th. Boulder Beer Co - Spirit Guide - Chokecherry Stout - October 8th. Brew on Broadway - Cinderella Twin Double IPA - October 7th. Bristol Brewing - RyePA - Rye IPA - October 10th 5pm. BRU ales & eats - Sasquash Pumpkin Porter - October 7th 3pm. Copper Kettle Brewing - White Stout - cask - October 9th 3pm. Copper Kettle Brewing - 2013 Port Barrel Belgian Dark Strong - October 10th. Copper Kettle Brewing - 2013 English Barleywine - October 11th. Copper Kettle Brewing - Malbec Barrel Aged Belgian Tripel - October 12th. Copper Kettle Brewing - Tequila Barrel Mexican Chocolate Stout - returns October 13th. Crabtree Brewing - Chunkin Pumpkin - returns October 9th. Crabtree Brewing - Headless Horseman - pumpkin/stout blend - returns October 9th. Crooked Stave - Origins Batch 2 - Burgundy Sour - October 9th 11am. Crooked Stave - L'Brett D'Or - oak aged Golden Sour Ale - bottle release - Oct. 10 11am. Dillon Dam Brewery - Peach Pecan Pilsner - 5 gallon batch - October 8th 5pm. Dry Dock Brewing - Ambassador Sour Ale - barrel aged - October 9th. Dry Dock Brewing - Jamaican Rum Vanilla Bean Oak-aged Imperial Pumpkin - October 11th. Echo Brewing - Blackberry Hefeweizen - firkin - October 10th. Echo Brewing - Double Dry Hopped Rye IPA w/Galaxy hops - firkin - October 11th. Echo Brewing - Double Dry Hopped Amarillo Session Ale w/Symcoe hops - firkin - October 12th. Elevation Beer Co - Inconceivable! - barrel aged Double IPA - mid-October. Elevation Beer Co - Apis IV - Belgian honey quad - returns mid-October. Gravity Brewing - Barrel Aged Mendacious - Belgian Blonde - October 8th. Gravity Brewing - Barrel Aged Steve - German Weizenbock - October 8th. Gravity Brewing - Barrel Aged Newtonian - Brett ESB - October 8th. Grimm Brothers Brewhouse - Devil's Riddle - bourbon barrel-aged Old Ale - October 7th. Grimm Brothers Brewhouse - Once Upon a Time - FlogenFlagenBier (sour) - October 8th. High Hops Brewery - Rooty Tooty Fresh (Hop) & Fruity - October 9th 5pm. High Hops Brewery - Wet Hop Ale - w/glacier, cluster, chinook - October 10th. High Hops Brewery - Habanero Agave - October 11th. High Hops Brewery - Dubbel Date - Belgian Dubbel w/dates - October 12th. Hogshead Brewery - Cook's Lane - Strong Pale - GABF Week. Hogshead Brewery - The Window Licker - Barley Wine - returns GABF Week. Hogshead Brewery - Hog's Xtra Stout - GABF week. Hogshead Brewery - Hog Wild IPA - w/chinook - GABF week. Left Hand Brewing - Sawtooth Nitro - bottle release - October 11th. Left Hand Brewing - Wake Up Dead Nitro - bottle release - October 11th. Loveland Aleworks - Mango Pale Ale - October 7th. Loveland Aleworks - Abbey Grand Cru 2013 - October 8th. Loveland Aleworks - Oak-Aged Imperial Stout - October 8th. Loveland Aleworks - Premium Bitter - cask - October 9th. Loveland Aleworks - Jasmine Tripel - October 10th. Loveland Aleworks - Cranberry Saison - October 10th. Loveland Aleworks - Coconut Porter - cask - October 11th. Loveland Aleworks - Sorachi Ace IPA - w/Cucumber on the side - October 12th. Mountain Sun - Wet Willy's White IPA - October 7th. Mountain Sun - Hop Harvest Saison - October 7th. Mountain Sun - Fresh-Hopped Hop Vivant Imperial IPA - October 7th. Mountain Sun - Dark Harvest Pumpkin Stout - October 7th. Mountain Sun - Saison d'Tesh - October 7th. Mountain Sun - Double Impact Belgo-American Imperial IPA - October 7th. Mountain Sun - Catburgler Belgo-American India Black Ale - October 7th. Mountain Sun - 1636 Abbey Dubbel - October 7th. Odell Brewing - Crush - White IPA - pilot brew - October 7th. Odell Brewing - Hela's Nectar - Pro Am Belgian Golden - October 7th. Odell Brewing - Stoop Slammer - sour mash - pilot brew - October 7th. Odell Brewing - Russian Imperial Stout - pilot brew - October 7th. Odell Brewing - ESG - Extra Special Ginger - pilot brew - October 7th. Odell Brewing - Submarine Screendoor - Pale Ale - pilot brew - October 7th. Odell Brewing - Rum Barrel Aged Stout - pilot brew - October 7th. Odell Brewing - Under the Bridge - cask - October 7th. Odell Brewing - Hand Picked IPA - fresh wet hops - October 9th. Odell Brewing - Creme Brule Porter - firkin - October 11th. Odell Brewing - Woodcut No. 7 - oak aged Russian Imperial Stout - October 12th. Odyssey Beerwerks - Raspberry Chocolate Nitro ESB - October 8th 2pm. Oskar Blues - Shadows, Greys and Evil Ways IPA - GABF draft only - October 10th. Oskar Blues / White Buffalo - The White Buffalo West Coast IPA - October 11th. Sanitas Brewing - Sanitas Black IPA w/vanilla beans - firkin - October 9th 4pm. Sanitas Brewing - Oso Grande - bourbon barrel aged Imperial Brown Ale - October 9th 6pm. Ska Brewing - Euphoria Pale Ale - October 10th 5pm. Ska Brewing/DC Brau - Taster's Choice - Dopplebock w/coffee - Oct. 11th. Steamworks Brewing - Elephant Rider Imperial Pale Ale - October 7th. Trinity Brewing - Old Growth - Flemmish Wild Brown - returns October 11th 12pm. TRVE Brewing - Doombier - blackened Grätzer - October 11th. Twelve Degree Brewing - Sorach - small batch - returns October 10th. Twelve Degree Brewing - Sorach L'Orange - small batch - returns October 10th. Twelve Degree Brewing - Velour Fog - Quadrupel - October 12th. Twelve Degree Brewing - Hayride Saison - Farmhouse Ale - October 12th. Twisted Pine Brewing - Reilly's Oak Whiskey Red - October 7th GABF week. Twisted Pine Brewing - Wilson's Sour Brown - October 9th. Twisted Pine Brewing - Big Shot O' Bourbon - barrel-aged Big Shot Espresso Stout - Oct. 10th. Twisted Pine Brewing - India Pumpkin Ale - October 11th. Twisted Pine Brewing - Oak Aged IPA - barrel aged Hoppy Boy - October 12th. Upslope Brewing - Upslope Barleywine - October 9th. Upslope Brewing / Illegal Pete's - Illegal Peach Session Ale - October 9th. Upslope Brewing / Crooked Stave - Brett Belgian Pale Ale - barrel-aged - October. Verboten Brewing - Bourbon Barrel Aged Kentucky Common - October 8th. Verboten Brewing - Most Irregular - Pumpkin Porter - October 9th. Wild Woods Brewery - Tropical Paradise Imperial IPA - October 8th. Wild Woods Brewery - Pro-Am English Mild - October 8th. Yak & Yeti - Needles! - Spruce ale aged on cedar chips - October 8th. - Colorado Beer Releases October 1-6, 2013. - Colorado Beer Releases September 23-30, 2013. 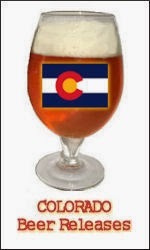 - Colorado Beer Releases September 16-22, 2013.